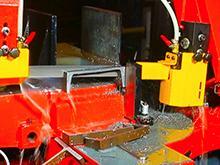 Synthetic metal working fluids often provide the best cooling performance among all cutting fluids. When a full synthetic coolant is needed The C-5300 from Q Fluids the right choice. 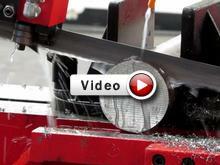 Formulated specifically for Sawing and grinding applications. This premium synthetic coolant lubricates and cools the Saw Blade or grinding wheel, extending the tool life while enhancing the tooth penetration and grinding finish. C-5300 has been formulated to help prevent Chip Build up, allowing the chips to flow freely, preventing buildup in and around the critical parts of the machine. It cleans behind the band wheels, the blade guide and the chip brush assemblies. This will improve the life of your regular wear parts by up to 30% and help keep you machine clean. C-5300 is a non-foaming fluid that has a long tank life, its clean odor free formulation does not contain chlorine sulfur silicone sulfates, making it biodegradable and operator friendly. 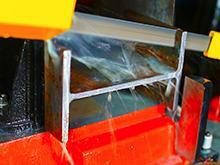 This is an excellent Sawing and grinding fluid used on most metals except magnesium.